The airplane is the 100th to join Qatar Airways’ growing fleet. 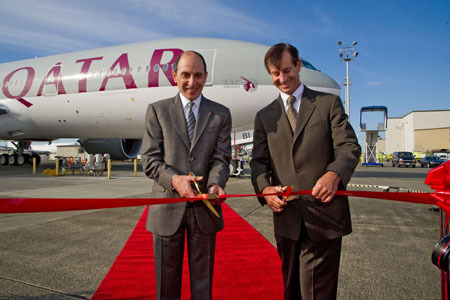 EVERETT, Wash., Sept. 30, 2011 /PRNewswire/ -- Boeing (NYSE: BA) has delivered Qatar Airways' 100th airliner, a Boeing 777-200LR (longer range), at a ceremony in Everett. The Doha-based airline now operates 27 Boeing 777s of various types, including 16 777-300ERs (extended range), two 777 Freighters and nine 777-200LRs. Boeing handed over the airplane to Qatar Airways at a ceremony attended by the airline's Chief Executive Officer Akbar Al Baker. Qatar Airways has 13 more Boeing 777s of different variants scheduled for delivery. "Since we received our first Boeing 777 in November 2007, the airplane has earned itself a reputation for comfort, versatility and reliability, and it is only fitting that our 100th aircraft is a 777," said Akbar Al Baker, CEO of Qatar Airways. "From an operational perspective, the 777 has enabled us to pursue our aggressive global expansion plans, allowing us to operate direct non-stop flights from our Doha hub in Qatar to destinations such as Sao Paolo in Brazil, and Melbourne in Australia, in a cost-effective manner. From a passenger perspective, the airplane offers unparalleled reliability, while its cabin architecture, combined with our award-winning Five Star service and interiors makes for one of the finest flying experiences for passengers today," said Al Baker. "We congratulate Qatar Airways on this significant milestone," said Jim Albaugh, president and CEO, Boeing Commercial Airplanes. "In just over a decade, Qatar Airways has grown to become a world-class, award-winning airline with a rapidly expanding network spanning six continents. This is a tremendous achievement by any measure and we are proud the 777 was selected to play a key role in this success story." Qatar Airways flies one of the youngest and most modern fleet of airplanes. Its current network includes over 100 destinations across Europe, Middle East, Africa, Asia Pacific, North America and South America. The 777 is the flagship airplane of the world's most successful airlines. Its demonstrated long-range and large payload capabilities give operators access to the world's fastest growing passenger markets. It is consistently ranked at the top of operator and investor pools because of its revenue generating capabilities.